If I can recall correctly, this new offer is the best ever offer for an AIR MILES credit card. Now I have covered over 30,000 bonuses on our sites over the years so I may be wrong but I'm pretty sure that's not the case. 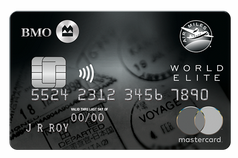 Right now when you apply for and receive the BMO AIR MILES World Elite Mastercard they will give it to you with no annual fee in the first year which means all of the bonuses and benefits it comes with come to you at no charge. Let's look at the sign up bonus. They have actually increased it with this offer of the first year free from the previous 2,000 miles to 3,000 miles! The 3,000 AIR MILES Reward Miles bonus is broken down as such: you'll receive 1,000 miles on your first purchase and an additional 2,000 miles when you spend $3,000 on eligible purchases (pretty much your everyday spending, things like interest, cash advances etc. are not eligible) within the first three months of having the card. When redeeming for flights we value AIR MILES Reward Miles at 11 to 15 cents each. This means the 3,000 miles with this card are worth at least $330. Even if you only run Cash Miles and not Dream Miles you are looking at approximately $315 in value. Not bad considering they don't cost you anything outside of your everyday spend. However the sign up bonus doesn't end there like it typically does. BMO has now thrown in a companion ticket rebate offer. When you redeem miles for two tickets via AIR MILES by November 30, 2018 you'll have the miles for the second ticket rebated to you. It doesn't matter where the redemption is to, it can be to anywhere in the World, as long as you have the miles for both tickets at time of redemption you can get the rebate. That's the kicker, having enough miles. So in all likelihood most of the companion ticket rebates will be used for flights within Canada or the U.S. as that is where the majority of AIR MILES redemption happen as most collectors do not collect enough miles for flights for two people beyond the borders of North America. That being said, maybe you are sitting on a huge nest egg of miles and have enough for two big ticket redemptions. Well before you redeem get this card and you'll effectively drop your redemption rate to 50% and be able to keep a large amount of miles in your account. To be credited the Dream Miles for your Companion flight ticket, you must book any two flights (one way or return) for travel anytime (subject to availability from participating suppliers at the time of booking) through airmiles.ca using your Dream Miles before November 30, 2018. Both flight tickets must be booked in the same transaction, and on the same itinerary (both flights must be travelling on the same day, departing from the same location in Canada, and arriving to the same destination). You must have accumulated a sufficient balance of Dream Miles in your Collector Account to use for both flights in the same transaction to be eligible for this Offer. You will be credited the number of Miles back into your Dream Account that is equal to one flight ticket (excluding all taxes, fees and applicable surcharges) within 45 days after your flight booking. 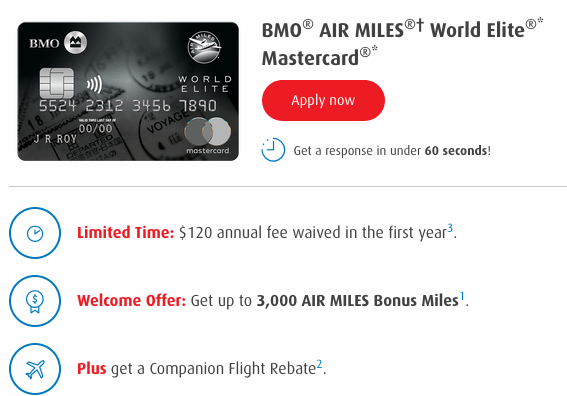 The combination of these three offers when you get this card (sign up bonus, first year free & companion ticket rebate) make this one of the strongest new limited time offers out there, especially if you are looking for an AIR MILES co-brand credit card. Even if you don't use the companion ticket rebate the card is still a great option to get with the $300+ value from the sign up bonus as you can always cancel the card before the 12 months is up so you don't pay the annual fee for year two. Remember as well the card also offers Priority Pass membership with two free visits and one of its strongest features: 25% off AIR MILES flight redemptions for travel within North America. Really there isn't a reason why you shouldn't get this card right now.